UnaLinea is a state-of-the-art model that simulates the evolution of the plan shape of a beach. The beach plan shape is determined by the position of a single contour, therefore making UnaLinea a "one-line model". UnaLinea uses a formulation of total longshore transport rate based on the widely used CERC formula. The model changes the coastline every time step, allowing for the correct simulation of the changing drift rates with time. A typical application of this model would be to study the impact that different interventions to the fluvial load will have in the adjacent coast in a medium to long term time. The accompanying user manual provides a guide on how to use the model itself. The predecessor tool had been derived by HR Wallingford as part of the FRMRC2 project, as a simplified, regional-scale one-line model of wave-driven beach plan-shape evolution, implemented in Fortran as a finite difference solution of the continuity equation for sediment (Stripling et al, 2011). The model assumes an average beach slope and does not consider short term changes in the beach profile. Offshore wave conditions are transformed into the position of breaking at each point along the beach. These breaking wave conditions are used to calculate the longshore drift at each of these points. The cross-shore change in position of the specified contour is calculated from longshore gradients in the wave induced longshore transport rate (see Figure 1). Due to the fact that the profile remains unchanged, the shoreline position moves forward or backward, according to the longshore drift gradients, translating the profile, as shown in Figure 2. The effects of engineering structures and active beach management techniques, such as beach nourishment or losses to offshore, may be included in the model, as may a simple representation of cliff erosion (Stripling and Panzeri 2009, Stripling et al, 2011). The beach plan shape is specified by the position of a single contour, usually either Mean Water Level or a particular high tide level. The model assumes an average beach slope and does not consider short term changes in the beach profile. Offshore wave conditions are refracted into the position of breaking at each point along the beach. These breaking wave conditions are used to calculate the longshore drift at each of these points. The change in position of the specified contour is calculated from differences in the wave induced longshore transport. In the presence of groynes, the sediment transport is considered zero at the groyne position, acting as an impermeable barrier. The UnaLinea model has been designed as a first-stage tool in understanding the behaviour of a coast and the impact of engineering works upon it. Its relative simplicity and ease of use allow the model to be used by non-specialist engineers with a minimum of data, as well as allowing more detailed investigations by more experienced users. For iCOASST the model was made OpenMI compatible. A general description of the input and output files is given here, although a detailed description of each of the input and output files is provided in the user manual. Model data: contains values for the different parameters and variables needed in order to set the model up. Data such as the depth of closure or the positions and sediment loadings of river are contained within the model data set. Wave data: contains time-series of wave conditions in shallow water. In order to model the littoral sediment transport, and its medium- to long-term response to the fluvial load, nearshore wave data covering several decades is required. UnaLinea can be run either deterministically, or in a stochastic manner (as is required here for dealing with coastal-fluvial sediment transport interaction). When UnaLinea is run stochastically, minimising processing time is important, as this methodology involves running the numerical model UnaLinea of the order of thousands of times. Input time series with hourly (or even three-hourly) conditions and grid spacing of the order of 10-25m is therefore prohibited. Input filtering is then required in order to increase the time-step of the time-series. 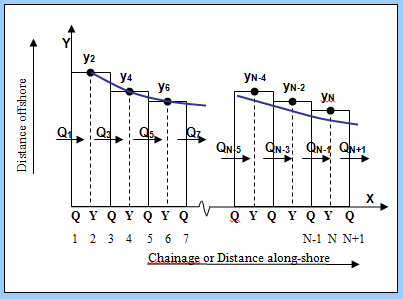 Shoreline development: position of the shoreline on the specified output times, as well as the maxima, minima and average shoreline positions throughout the run. Drift rates: longshore drift values along the beach on each of the specified output times, as well as the maxima, minima and average drifts throughout the run. Example input/output files and user manuals are included with the model files and can be downloaded from the UNALINEA Download Model tab. The iCOASST model results from UNALINEA form part of the Liverpool Bay composition files. Damgård JS and RL Soulsby (1997). Longshore bed-load transport. Proc. 25th Int. Conf. Coastal Engineering. 3, pp. 3614-3627. ASCE. Stripling, S. and Panzeri, M.C. (2009). "Modelling shoreline evolution to enhance flood risk assessment." Proceedings of the ICE - Maritime Engineering, 162(3) 137-144. Stripling S, Panzeri M, Blanco B et al. (2011). "Broad scale integration of coastal flood and erosion risk models." FRMRC2 Work Package 4.3 Science Report. http://web.sbe.hw.ac.uk/frmrc/ (accessed 04/02/2015).